High on the list of questions we are asked by prospective woodland buyers is whether it’s possible to live in a woodland. The answer has always been ‘very unlikely’: it can’t be done without planning permission, and it’s nearly impossible to get planning permission. However, with the Welsh Assembly Government’s scheme “One Wales: One Planet, The Sustainable Development Scheme of the Welsh Assembly Government” it may have become more feasible. The scheme addresses planning in rural areas in general, but also defines the approach to low impact development. One Planet Developments are developments that through low impact either enhance or do not significantly diminish environmental quality. The key requirement, for consideration as a One Planet residential development is that over a reasonable period of time (no more than 5 years) the land should provide for the minimum needs of the inhabitants in terms of income, food, energy and waste assimilation, and must be the sole residence of the inhabitants. Any planning application must be supported by a management plan produced by a “competent person”. The Lammas Project was one of the first to get started, involving the creation of a new community on agricultural land near the village of Glandwr in Pembrokeshire. It involves the creation of an eco-village of nine families. Construction started in autumn 2009. The text of their planning application, the first low impact application to be passed in the UK, is available on their website. There is nothing in the “One Planet Development” policy, however, that requires the creation of an eco-village community: the policy is equally applicable to individual developments. Please talk to us if you are interested in pursuing a One Planet Development application on any of our woodlands or meadows. We’re interesting in buying a plot of land around that area. Do you have some contact details that we can reach you on for some further info? Am also intrigued by this comment albeit somewhat late in enquiring. 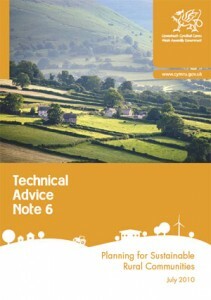 Am moving with my five grown-up children to try to buy some land and live a healthy environmentally friendly life in Monmouthshire and need all the help and advice I can get but not sure how to start or who to ask. Any guidance will be truly appreciated. This comment made on 17th Jan 2013 by J, where did this come from, I am intrigued. There is a law that if a man can build a home and have smoke from his fire before sunset then the home and the land within the throw of his axe is legally his, this law. this law like many others cannot be changed or altered unless you were present when the law was made. the law was made 500 years ago. Our policy is not to use the covenant to block or preclude a TAN6 development at a suitable location. The covenant is not necessarily compatible, but, where appropriate, we are willing to modify the covenant. Please talk to us about your plans and requirements. How does a TAN 6 One Planet Development work with the Woodlands.co.uk covenant, are the two compatible? I recently got a letter regarding this for my newly born baby boy. It is a great idea to do this and it will also drum up a lot of tourism for those forests where they have been planted.